How to Keep Marine Diesel Fuel As Clean As A Whistle. There's ample reason for supplying squeaky clean diesel fuel to your marine motor. Junk fuel clogs filters, kills injectors and smokes like a chimney. The remedy begins dockside. Before topping off the fuel tank, pre-filter the diesel fuel using a Racor or West marine funnel. Both the Racor and West Marine filter funerals are available in different sizes, each one flowing different volumes of fuel, for example 2.5, 3.5, 5 or 15 gallons per minute. Constructed of polypropylene, they are impervious to corrosion. Prices range from about $14.00 to $55.00. How they work is as simple as sea salt. They prevent large particles from even entering the fuel system. The Baja also excludes water. You should also know it's a good idea to keep fuel tanks full. Otherwise temperature changes cause water to condense on the tank walls. A full tank minimizes the problem. The next strategy is to install a dual, in-line filter with water separating capably. The first filter pulls out trash down to 30 microns in size. Next in line is a ten micron filter that extracts the smaller stuff. In theory you'll change the 30 micron filter more often than the ten. Racor's three-stage turbine assembles first centrifuge the fuel which flings large particles and droplets of water into the sediment bow. The second stage coalesces any remaining water into droplets that also fall into the sediment boat. The third stage functions like a conventional filter element. You should also know many filter assembles can be wired with an alarm that alerts you when water level in the sediment bowl has reached a critical flood stage. 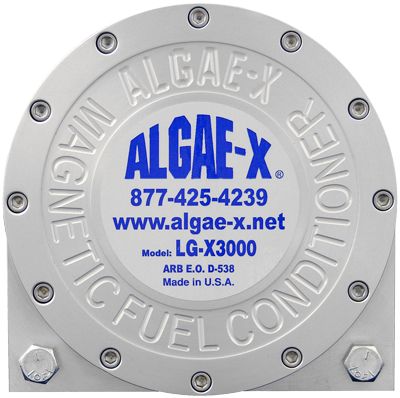 The ultimate fuel scrubbing system would include a fuel catalyst systems, such as the one offered by Algae X company. It does its work by flowing diesel fuel through a magnetic field. Finally, let's consider the state of the art in diesel fuel.Today's fuels are not refined. Instead catalytic cracking allows refineries to harvest 85 percent of a barrel of crude oil, compared to old method's mere 50 percent. Compared to old diesel fuels new blends of diesel are unstable in that they want to revert to heavy oil. Microscopic particles grow larger and larger, solids, gum, varnish, sludge and slime form, plugging filter elements, destroying fuel injectors, eroding fuel economy and make great billowing clouds of exhaust smoke. Algae X magnet fuel conditioners influence diesel fuel at the electronic level, maintaining its integrity.